Gilberte Interiors, Inc. A Modern Family Makeover - Gilberte Interiors, Inc. The space and volume of this 1980s building was wonderful, but the décor, design, and lighting seemed dated and didn’t sync with the family’s taste. Additionally, some of the stairways were no longer up to code and the architect’s in-home office could be put to better use. Our strengths in space design and construction allowed us to propose a redesign for the second entry to create a mudroom and direct access into the house, making it much friendlier for young children. Meanwhile, we reconfigured the commercial office on the third floor into a spacious guest room. We added a full bath with a walk-in shower and wall-hung toilet to maximize space. Each of the other baths in this home were updated with new tile, fixtures, fittings, and lighting. 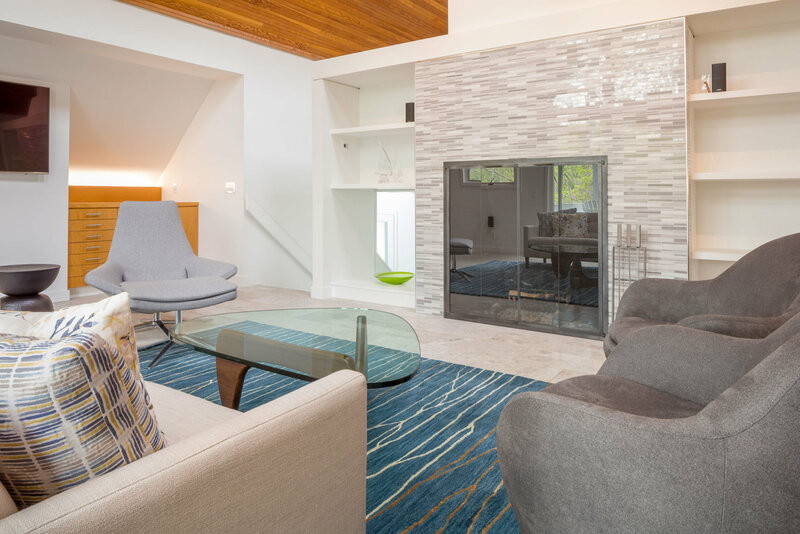 The living room was completely transformed with all new walls, complete with shelving, installed around a central fireplace, while large-scale stone floors replaced the original tile. Since the “bones” and setting of this 30-year-old house were what attracted the family, Cheryl focused on creating an interior design that brought it into the twenty-first century, while Aharon transformed the baths and lighting to make it feel like the home they wanted. Through close collaboration with Clow Construction, the Gilberte team was able to transform the space into the modern family home the owners had been waiting to own for years.